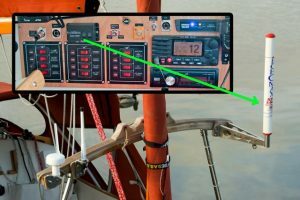 Choice of equipment: My past experience on research ships has taught me how difficult it is to see a standard radar reflector on a ship’s radar. A report by Qinetiq (Luke 2007, Performance investigation of marine radar reflectors on the market, QINETIQ/D&TS/SEA/CR0704527/2.0, 34pp) confirmed that the smaller radar reflectors which would be suitable for use on Seatern are, frankly, worse than useless. Anyone choosing a radar reflector for a small boat should read it! An active radar transponder like the “Sea-Me” is much better than a reflector. Practical Boat Owner (September 2009) compared the Sea-Me and Echomax Active-X transponders and found the Echomax to be better. Both companies now offer transponders which work in both X-band and S-band. Ships out at sea favour S-band because because it is less affected by sea clutter. However, small boats and ships near land are more likely to be using the higher resolution X-band. Since I don’t expect to be going far from land, and will be transmitting AIS signals also, I decided to economise and fit and Echomax Active-X unit rather than the dual unit. Installation: Because radar wavelengths are short (3cm for X-band) the transponder antenna must not be placed where it would be shielded by items like the main mast. Fitting it to the top of the mast would be possible but it is quite a large item with a relatively heavy mount. It is therefore attached to the boom gallows on a mount extending aft to try to protect it from being hit by the boom. It is as far outboard as possible to keep it away from the mizzen mast. The electronics unit is small and is surface mounted on the front of the electronics panel. In Use: The light on the electronics unit blinks when it is being scanned by one or more radars. I have no way of knowing if the transponder is actually working and enhancing my radar echo! That’s probably it’s only disadvantage compared to a large passive reflector.